We’ve survived dozens of December/January launches, so we know how it goes: The team has worked hundreds of hours writing, rewriting and editing your email sequence for the launch. You’ve spun up new Landing Pages and countless variations of Facebook Ads have been loaded up, ready to go. The tech team hasn’t slept in a month (and now they hate you), but they’ve made every line of code perfect – or as good as it gets on these deadlines. Now here you are, surviving on coffee and leftover turkey. Gritting your teeth, bracing for launch. And the last thing you want to do is work more. But what if just a few extra hours could drastically improve your launch? We’ve seen each of the following five marketing tactics drive six-figure results for our clients. Whether it’s testing to find the perfect sales-generating headline or properly tracking to target your most valuable lead sources, these strategies drive massive results – without changing the core of your launch. Think about what we’re saying: You’ve already worked 300 hours and you’re expecting a $600,000 launch, but if you take just a few more hours to implement these techniques, you could unlock an additional six-figure revenue. We think that’s worth the time. So fire up the Keurig or Aeropress and let’s get started. At its most basic level, a tagging strategy is a naming convention: you decide what you want to track, choose a naming convention for the variables you’re tracking, and start naming them. Tag people based on links they click. Tag people based on whether they’ve already bought something. Tag people based on “Lead Magnets” they’ve signed up for. For every action or behavior that is critical to your business, apply a corresponding Tag. That’s right Infusionsoft users, this is reporting on Tags you can actually use.. Can’t get this anywhere else. Think of the data in this Tags report as the knowledge center that will inform all of your future marketing – during and after your launch. The more smart, relevant information you add to it, the more actionable analytics you will be able to generate, and the smarter and more relevant your subsequent marketing will be. You’ll also save TONS of time later by setting yourself up to see how these Tags monetize over time (e.g., How much money do they generate when the launch is said and done? How about after the downsell? A year later?) If you’re ready to get started, check out our free tagging guide for a quick guideline on how to accurately track your launch. Email open rates are really the measure of a single thing: how compelling are your subject lines? A single lead from a targeted online community could be worth a lot more than thousands of leads from a popular news site, but you’ll never know if you’re not tracking them with website tracking codes. For example, your site may get 1,000 leads from an article you wrote for Huffington Post, yet you only earn $1,000 from those leads. But the 100 leads you get from an article in an industry-specific blog could net you $100,000. Identifying the sources your leads convert from will help you see past traffic number to find your highest quality referrers. Most Infusionsoft marketers are so busy helping their affiliates get what they need during a launch, they don’t analyze individual performance. This is like treating every social media channel the exact same. It results in money (and opportunities) left on the table. Every affiliate is an individual channel and you need to know, in real-time, how they’re performing so you can continually help them optimize their efforts. For example, some affiliates produce high revenue but bring in a small number of leads, while others are the opposite. SegMetrics’ affiliate dashboard helps keep track of each affiliate during a launch, making it easy to keep your strongest earners engaged and motivated. The last step in your launch rescue is to track how well you’re converting paid leads. For example, if you spent $1,000 on Facebook ads, got 5,000 clicks, and made $250 total, that’s not a good conversion rate. But $10,000 worth of sales from 5 clicks on a an ad? Much better. UTM tracking codes on ads and links help you better monitor conversions. Setup UTMs for every traffic and lead generator to give you a complete picture of where your leads and conversions come from. That includes segmenting traffic into each marketing channel, like email, social media, and that site you’ve never heard of that’s suddenly sending you thousands of visitors thanks to a backlink. 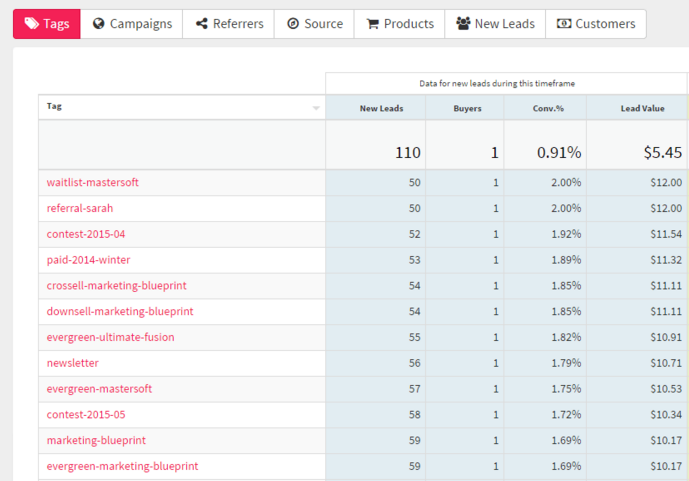 Use as many UTM-coded links as you can so that you can use SegMetrics to see how many sales those links generate. We get it: Product launches are difficult. But with just a few extra hours you can earn more money with your product launch than you ever thought possible – who wouldn’t make that trade? Have you used any of these steps to ramp up your launches and increase their value? Drop us a comment and let us know. We’d love to hear from you.